They’re wives, mothers, students, nurses and artists. They’re strong and resilient, yet compassionate and welcoming. They’re also fierce, fast and determined to knock their opponents over. They are the Rainy City Roller Dolls. 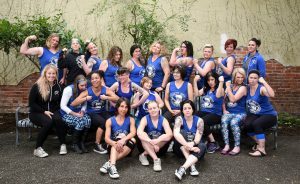 Comprised of over 20 women from the Puget Sound area, the women’s flat-track roller derby team has been tearing up the floor of the Centralia Rollerdrome since 2007. Originating as an offshoot of the OlyRollers in Olympia, the team has since evolved into a thriving community of women looking to work hard and build friendships. “We’re all so different, but we come together for a common thing,” said president Jessi “Crack Attack” Brannin, who has been with the team from the beginning. Defying the stereotypes surrounding roller derby that often involve theatrics or senseless brutality, the Rainy City Roller Dolls are nothing but dedicated to their sport, putting in long hours of intense training in order to grow as team. Between practicing three times a week, monthly matches, traveling and set up, being a Roller Doll is a full-time job. “A lot of people think it’s about fishnets and tattoos, and don’t see it for what it really is. Now I think that it’s coming into the limelight and people are seeing it as a true sport,” said blocker Jennifer “Total Jen-o-cide” Davis. 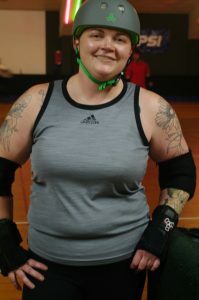 In the sport of flat-track roller derby, there are three positions: jammer, blocker and pivot. 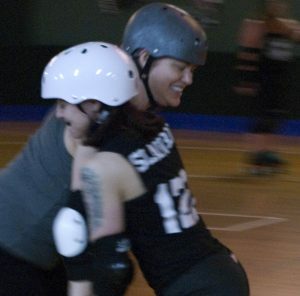 The jammer’s job is to race through the pack and score points by passing the opposing team’s members. The blockers assist the jammer by opposing the other team’s jammer, while the pivot sets the pace of the pack and also keeps the opposing team’s jammer from breaking through the pack. Each pack consists of eight skaters, or four members from each team (one pivot and three blockers each.) The jammers line up 20 feet behind the pack on the jammer line. When the whistle blows, the skaters take off. The jammers will then fight their way through the other team’s blockers, and the first jammer to make it through the pack without accruing penalties is appointed the lead jammer. Once the jammer makes it through the pack, she will race around the track and fight her way through again. During her second time through, however, she scores points for every opposing team she passes. The jammer will do this until the jam ends or the lead jammer calls it off. Each jam (the activity detailed above) is a two-minute session. There are numerous jams in a period, which is either two 30-minute sessions or three 20-minute sessions. After each jam, the girls on the track are replaced with new players. Each game played is called a bout. “There’s no fist throwing. There’s rules, and we follow them. We’re truly an athletic team, and not just a fist fight,” said member Dawn “BJ” Pitts. However, the sport is not for the faint of heart. It requires full-body contact, great agility and the endurance to skate 27 laps in five minutes. “It’s a good way to get out any aggression you have. You’re working out and working out hard,” said Brannin. Although they’re not afraid to get rough on the rink, the community of women found in roller derby is nothing but cohesive and encouraging. For Jennifer Davis, a military wife, being part of a league has been a great source of consistency and stress relief as she’s traveled around the country and worked on her master’s degree in nursing. The team accommodates a wide age range from early twenties to mid-forties, and provides support and benefits to women from all walks of life. “It keeps us that are older feeling young, and those who are younger get mentored,” said Davis. The youngest member of the team, jammer Aeisa “Holy Eep” Johnson, has been with the Dolls for four years, and she hopes to stand with them for many more. “Even if I’m not skating, I still want to be part of it,” said Johnson. 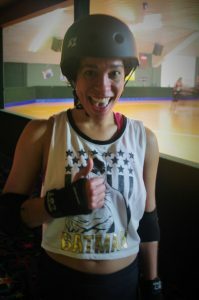 The youngest member of the Roller Dolls, Aeisa “Holy Eep” Johnson, is inspired by her teammates. Whether it’s sponsorship or fundraising or cheering on the team, there are plenty of ways to support the Dolls. For Dawn “BJ” Pitts, a board member and head of sponsorship and fundraising, her involvement also includes event planning, sponsorships and working with insurance companies. “It takes a lot of people in the background to make this a possibility,” Pitts said. In order to keep the team running, the Rainy City Roller Dolls hosts many fundraisers each year, including the Skate-A-Thon where they skate five miles on the Western Chehalis Trail from Tenino to Yelm, braving the August heat. In addition to hosting spaghetti feeds and silent auctions for their team, they are also actively involved in community service and donate their time and money to local charities, such as women’s shelters and the humane society. The Rainy City Roller Dolls hosts quarterly tryouts per year, where potential recruits are tested on the basic skillsets of the Women’s Flat Track Derby Association. To find out when the Dolls are skating next, or how to join, visit their Facebook page or webpage for more details.